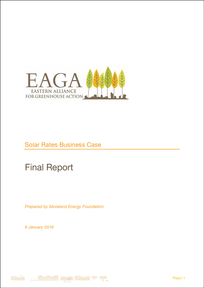 NAGA has been working with the Eastern Alliance for Greenhouse Action (EAGA) to develop a business case for rates based financing programs that support residential solar. 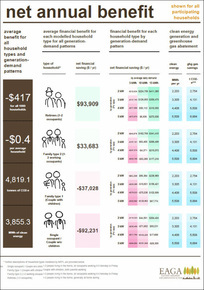 This business case report presents an independent and objective analysis of the costs and benefits of a state-wide solar finance program that assists low income households in Victoria to access solar photovoltaic (PV) systems. The project analyses the economic, regulatory and technical viability of council rates charges and other low income solar finance options, develops a recommended program model, and establishes its business case. The business case is accompanied by an Excel-based tool for calculating the benefits of the different models considered in the report. Click on the image on the left to access the tool.